I’m currently updating the photo gallery, which means that I’m adding missing pictures in all categories, re-sorting them, replacing low quality ones with high quality images, cleaning the albums, removing duplicates, re-structuring the albums and categories and so on and so forth. I don’t know why I actually started with the photo shoots when the public appearance section definitely needs it more, but it’s just that I came across a photo shoot recently that I personally have not seen before and therefore added it to the gallery. Stay tuned for huge gallery updates and a well-structured photo gallery soon! I just started with the 1987 photo shoots. Enjoy! Los Angeles, Jan 11 (PTI) A television series based on Gregory David Roberts Mumbai-set novel, Shantaram, is in the works. Paramount Television and its frequent collaborator Anonymous Content have landed the rights to the best-selling novel after a month-long, multiple outlet bidding war, according to The Hollywood Reporter. The mob drama was previously supposed to be a feature film, featuring Joel Edgerton and Amitabh Bachchan, with Johnny Depp and Brad Pitt as producers and Mira Nair as director. The two companies have also acquired the rights to Roberts follow-up novel, The Mountain Shadow. Anonymous Contents Nicole Clemens and Steve Golin, and Andrea Barron will executive produce. “As a huge admirer of the material, Ive been tracking this book for more than a decade,” Golin said in a statement. Which one is god and which one is the devil? It’s a question you might ponder after watching the totally NSFW video for Marilyn Manson’s single “Say10” One sits on a white throne, his face and hair painted a ghostly white, with streaks of black paint across his lips, eyes and cheeks, a cigarette dangling form his crooked grin. The other strides a black throne, his gangly limbs covered with black leather, face also painted in black and white. Both, of course, are surrounded by nearly naked woman crawling all over their perches. 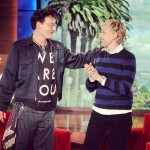 Gwyneth Paltrow, Johnny Depp, and Paul Bettany make an appearance on The Ellen DeGeneres Show, airing today on NBC. The trio, who all star in the film Mortdecai, played a game of “Never Have I Ever” with Ellen while on the show! Edward Scissorhands. Willy Wonka. Jack Sparrow. Gilbert Grape. It could only be JOHNNY DEPP! The superstar actor is back to see Ellen just as his new film “Transcendence” hits theaters. Johnny’s innate sense of the fantastical has made him one of the most sought after talents in Hollywood, and his smoldering good looks earned him the title of Sexiest Man Alive! He may not dance, but that doesn’t mean Ellen doesn’t have something unusually fun in store when everyone’s favorite pirate comes through! For the first time, Johnny Depp confirms to Savannah Guthrie that he definitely is engaged to wed actress Amber Heard. For the full interview, tune in to TODAY Friday morning. 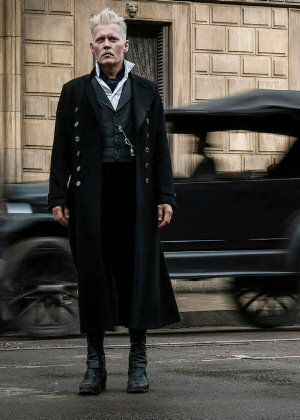 Sat 10 Aug 2013 10:00 Johnny Depp chats to Edith about his part as Tonto in The Lone Ranger – a native American warrior who recounts the untold tales that transformed John Reid, a man of the law, into a legend of justice. Yee haaa!